Jane Fisher’s Oct-Nov 2008 exhibition Down Time is written up by DeWitt Cheng in the February issue of Artweek magazine. In his review of the 20 year (1988-2008) survey, Mr. Cheng provides a timely and refreshing perspective on contemporary realist painting and Jane’s unique point of view and approach. He writes, “Given that many contemporary art objects seem to require technical manuals to gain a sense of their meaning, it’s a relief to contemplate realist painting which is user-friendly and intuitive by comparison”. The Crocker-Kingsley Juried Biennial exhibition at the Tsakopoulos Library Galleria in downtown Sacramento was written up in The Sacramento Bee. Gage’s new series of paintings, “Windows”, is on display until April 12 in our Side Gallery. Gage is teaching an 8 week Drawing and Painting with Pastels class for beginning and continuing artists, starting Wednesday, April 8th at the Sharon Art Studio in Golden Gate Park. An image of Susan Danis’ assemblage Bed is featured in the Handmade section of Craft’s Magazine’s March issue along with a profile of Susan and her work. The article explores the creative process involved in creating Danis’ unique art pieces; collecting objects that later make their way into her pieces using Bed as an example. The piece include an old French bed frame, a mattress, a pee-stained sheet from a thrift store, fishing line, tied shoes, ice skates, velvet, horns, skulls and horse jaws. “I try to embrace the universe as it is,” explains Danis. Gary Brewer’s Artist Profile is featured in Art Ltd Magazine’s first Special Eco Issue. DeWitt Cheng begins the Profile in the late 1990’s when Gary became dissatisfied with the abstractions he was then painting and begins “creating the strange hybrid amalgamations of flora, grafting together cryptobiology and environmentalism”. Cheng compares Brewer’s “meticulous realism” to the 19th Century’s marriage of science and art, recalling Audubon’s dramatic bird paintings. He concludes, “The paradox of traditional art, that reality transfigured by the imagination can help us perceive things properly, from a higher plane, is so old as to be new again”. We are honored to have Gary Brewer’s painting Intimate Space selected for the cover of Nob Hill Gazette Magazine’s April issue. 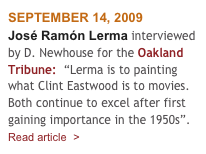 Publisher Lois Lehrman personally selected the painting after receiving the announcement for Gary’s Seductive Nature exhibition. Several Gazette readers who saw the cover attended Gary’s Artist Talk on April 4. Congratulations on this well deserved visibility Gary! ArtZone 461 donated Jessica Dunne’s print Parked Car and Gary Brewer donated his painting Silver Messenger to Small Treasures, this year’s Visual Aid Spring Art Auction event hosted by Chronicle Books. The festivities included both live and silent auctions and a preview party with light hors d’oeuvres, wine, champagne and a chocolate tasting bar. Veteran celebrity auctioneer Stephen Tourell presided over the live auction. Auction proceeds benefit Visual Aid programs that encouraging artists with life-threatening illnesses to continue their creative work. Includes donations from ArtZone 461 Gallery, Jessica Dunne and Gary Brewer. In her article: Sculptures and paintings at ArtZone 461 stress connectivity, Bonny Zanardi reviews Adam Cahoon’s and Linda Raynsford’s two person show Science Fusion and Nick Coley’s Concrete Perspective. at Diablo Valley College, Pleasant Hill, CA. Congratulations, Jane! a one day exhibition by 17 young artists participating in the Summer Art Institute. Parents, friends and gallery visitors gathered to see the young artists’ paintings, sculptures, watercolors and glass pieces. Jewish Funds for Justice, a national public foundation, held a brunch honoring Bay Area community activism, leadership, education and advocacy for social security at ArtZone 461 Gallery in conjunction with the SF Jewish Film Festival. The Gallery will be open by appointment only during these three weeks. We reopen on Sat. 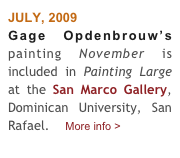 Sept 12 with exhibitions by Gage Opdenbrouw and Jose Ramon Lerma. 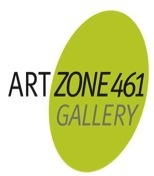 ArtZone 461 hosted a Press Conference to announce that Valencia St. Businesses remain open during the St. improvement project. Supervisor Chris Daly and DPW headlined the Press conference covered by abc’s and nbc’s local news teams. Fisher’s painting Watching the Coaches sold during auction day! Kevin also have an upcoming show of new paintings in the Argazzi Art gallery in Connecticut!